Well, I can safely say that this wasn’t the healthiest weekend for Taste Tester and I. It was a good one, though! Custard is one of those desserts that I could generally take or leave. However, when you add chocolate, peanut butter and pretzels to it, I’m all over it! 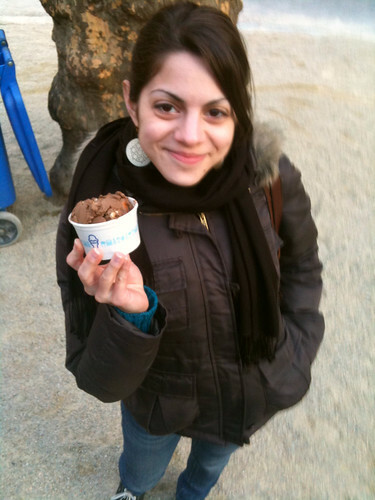 If you’re not familiar with Shake Shack, it’s a burger shack in nyc’s Madison Square Park. Such a large crowd gathers every day that they have a live web cam broadcast so that you can scope out the length of the line before you head over. Though it’s outside, I have only gone in the winter to avoid the lines of summer that are regularly an hour or two long. The downside to going in the winter of course is that you’re eating outside and it’s cold. Cold french fries don’t taste very good so you have to eat relatively fast. You may think, ‘okay, avoiding a line isn’t worth scarfing fast food in the cold’. 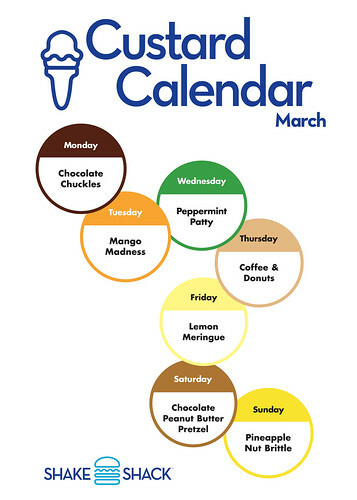 However, Shake Shack changes up their custard flavors every month and March’s Saturday custard was Chocolate Peanut Butter Pretzel. Cold or not, you know I wasn’t about to miss out on that! Here’s me smiling because there’s a chocolate peanut butter treat in my hand. My younger sister who doesn’t quite get the whole food-blogging thing playfully proclaimed, “You guys are such dorks!” as Taste Tester snapped this photo. Being an infrequent custard consumer, I don’t have a great base to compare this experience to. 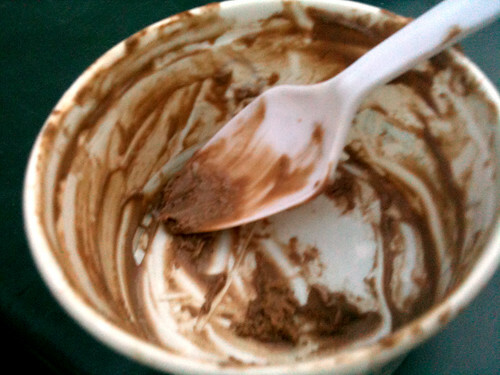 However I can tell you that it was incredibly rich and thick and had a great presence of dark chocolate and peanut butter. The pretzels miraculously stayed crunchy despite being engorged in the moist custard. Perhaps this is because they make it fresh around the clock? I thought the custard was an interesting alternative to ice cream if you want something a little different. Burgers, fries and custard made for a heavy meal but somehow we fought through it. Unfortunately we caught this flavor on the last day it was available. They have interesting flavors all the time though, some of which have repeat appearances during other months, so it’s totally worth checking out even if this one’s not on the list. They also have a peanut butter milkshake which I highly recommend. It’s one of those shakes that’s so thick a straw is basically worthless. Yeah – good stuff! Check out Shake Shack on your next trip to NYC. And if you come in the winter and aren’t as nuts as us, they also have an indoor location uptown. Holy cow that looks great! 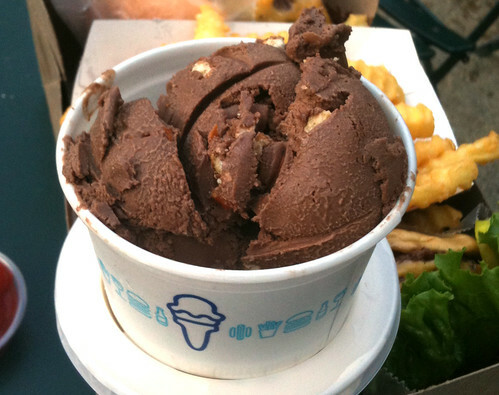 We have a local custard place called Connies right up the road, and there is NOTHING better than chocolate custard with peanut butter chunks! 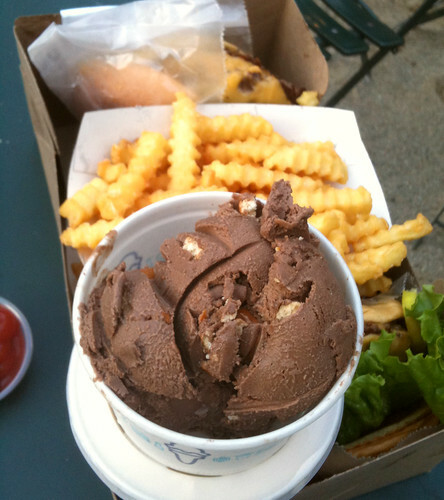 I can’t wait to get around to trying another custard place.. I guess I’m just never in the right place at the right time. Oh well.